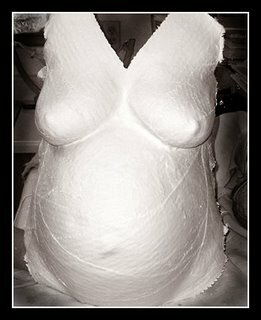 My friend, who does belly casts professionally, came over this morning to do a belly cast for me. I’m 37 weeks today and it seemed like a good time for me to do it since who knows if baby boy is going to decide to come early or not (wishful thinking). Anyway, it went well and I think the cast turned out beautifully. She’s taking it home to smooth it out and put a primer on it and get it ready to hang. Then I can put it on the wall or paint it or whatever I decide to do. I need to look online for inspiration. I know there are a lot of cool things that can be done with them. Actually, with a quick search, I just found some cool ideas here and here. I love the one with the baby’s footprints on the cast. So sweet! It turned out really well, Amy! That’s neat! 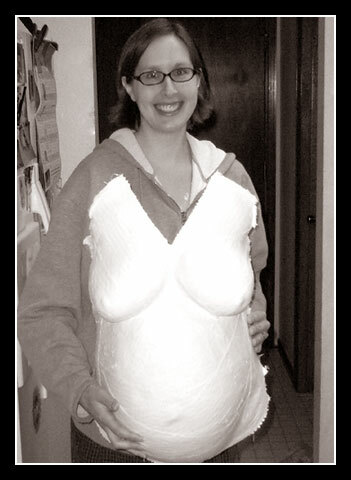 How long did you have to wear the plaster? Was it cold going on? amy – it took about 45 minutes from when she started applying the plaster to when it came off, so not bad at all. it was a little cold going on, but my body temperature is so high these days, it could’ve just been me. 😉 i’ll probably display it in my bedroom after i paint it (though i’m not sure how i’m going to paint it yet). Looks good! I’ve seen some lovely ones done here with paua and flax weaving.